Root Canal Treatment – What is it? Your first appointment will consist of an x-ray. This will confirm which tooth is infected, and determine if there is an infection forming at the tip of your tooth’s root. 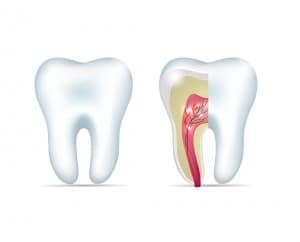 If you require a root canal treatment, then you will need two to three (depending on how many canals your tooth has) appointments (of 1 to 1½ hours duration) to complete your treatment. During your root canal treatment, we will use fine files to shape and clean the canals of your tooth (as per the picture below). This removes any of the remaining infected pulp. Anti-inflammatory and anti-bacterial medicines are then put inside the canal to stop the infection and inflammation. This process is repeated over two to three visits. X-rays throughout your treatment will confirm the length of your canals and that all of the infection has reduced and begun to heal. On your final visit, to protect the inside of the tooth and prevent any further infection, the canal is packed with gutta-percha (a natural product made from sterilised tree sap). Your tooth will then have a temporary filling placed on top and left for a few weeks to settle. Once we confirm that you have no further problems with your tooth we will either suggest a basic filling, a crown, or an inlay-only to complete your treatment. As infected teeth can be quite painful, and can cause swelling, inflammation and fever, root canal treatment can alleviate all this pain, ensuring that you can eat and drink normally. 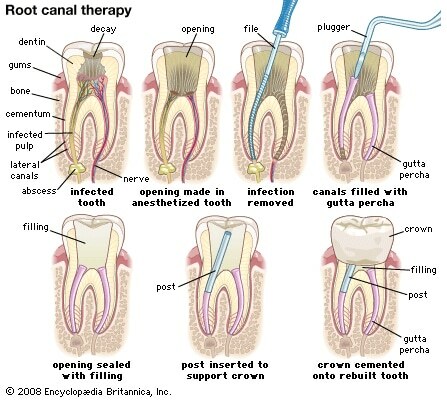 Root canal treatment prevents re-occurring infections from bacteria that may be lingering in your tooth’s pulp chamber. If an infected tooth is left untreated, an abscess can form, which may lead to bone loss and affect surrounding healthy teeth.